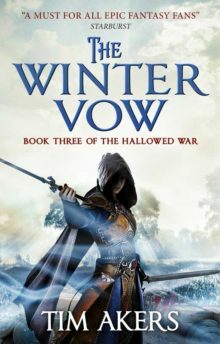 But The Hallowed War series was sold and contracted as a trilogy. The Pagan Night was written (though in need of revision) and I had a synopsis for the other two books. The act of revising The Pagan Night created significant change in that larger synopsis, though, so when it came time to write The Iron Hound, I needed to rewrite the synopsis. And it’s a good thing that I did, because my first attempt was… poor. After a few rounds with my editor, I realized the problem was that I was writing a good book, but not a good second book in a trilogy. The story I was trying to tell required a full trilogy to tell, but I wasn’t advancing that larger narrative the way I should have been. I was tracking my novel-sized goals, but not my trilogy-scale targets. This is part of the reason The Iron Hound took so long to reach shelves. I lost six or seven months in this process. It didn’t really take me any longer to write, but it took nearly the same amount of time to conceptualize. That’s what happens with writing. Sure, I can write 1000 words a day without much effort, and should theoretically finish a first draft in about 160 working days (maybe I should start writing shorter books?). But there’s a lot of work around that work that slows things down. So what makes a second book? For me, the main thing is keeping an eye on character development and plot progression. If you look at the outline for the entire trilogy, the whole story is about the same shape as an individual novel. Book one is about introducing the characters and the world, then presenting the core problem that’s going to motivate the entire trilogy. Book two involves rising tension, reversal, and movement toward the final confrontation. Book three tells the story of the long anticipated final confrontation, the moment of darkness, and the ultimate triumph of the heroes. This is for really standard storylines, and playing with that model is both necessary and interesting, but for purposes of illustration it’s sufficient. It’s also important that each individual book have a satisfying conclusion, so that the reader doesn’t feel tricked into buying the next book. It needs to stand alone, but still point toward the next book. Each book needs to be a self-contained microcosm of the larger narrative, satisfying but always contributing to the big story. Otherwise you’re just treading water. It’s better than drowning, but you’re not getting anywhere. Book two is still similar. The characters are already established, and the threat pointed to at the end of book one needs to be developed into the true motivating force of the trilogy. By the end of book two, the reader should be anticipating the final confrontation coming in book three, while still being drawn to a satisfying conclusion. Too many hanging narrative threads will be unsettling. Too few, and the reader has no reason to look forward to book three. I’m pretty sure the middle book in a trilogy is the hardest to manage. You have to balance the larger narrative without ignoring the page to page motivation of the characters. You have to hint at the final confrontation of the trilogy without diminishing the final confrontation of the second book. And you have to give your characters an appropriate amount of personal development while still giving them room to grow in the final volume. It’s tricky, maybe the trickiest thing I’ve ever had to write. Unless the last book is trickier. I don’t know. I’m still writing it.